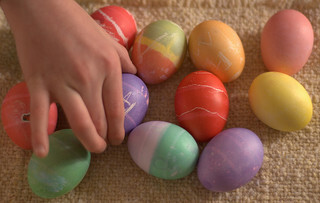 Easter is coming soon, and you may want to find some fun activities to do with your family. 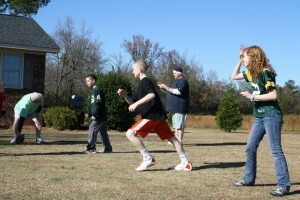 I’m going to tell you about one activity your whole family will enjoy – Raleigh Easter. Raleigh Easter is an annual (every year) event in downtown Raleigh. It is the largest Easter event in the city. The city of Raleigh has small events in various parks, but if you want to see a bigger event, you should check out Raleigh Easter. What can my family do at Raleigh Easter? 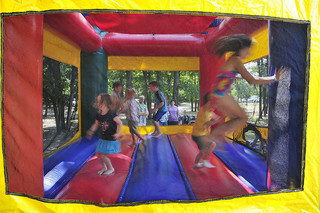 Raleigh Easter has many fun activities for children. They can jump in an inflatable (filled with air) bounce house, they can play games, they can get free balloons, and they can find Easter eggs with toys and candy inside. There will be 7 different times for egg hunts and 60,000 eggs to find! I’m worried that my young children will get hurt by older children. Don’t worry. 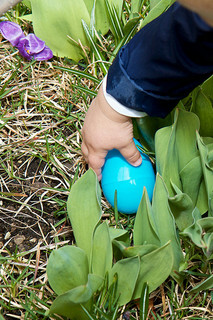 Raleigh Easter has special times for young children to find eggs without older children around. Your little ones should be very safe. Raleigh Easter is FREE! When you arrive, you must go to the registration table to get a wristband (a plastic bracelet like you get at a concert or the hospital). The wristband will help the volunteers to know your child’s age so that he/she is in the right egg hunt group. When and where is Raleigh Easter? This year, Raleigh Easter will be on March 26 at Halifax Mall in downtown Raleigh. Halifax Mall is located at 423 N Wilmington St. 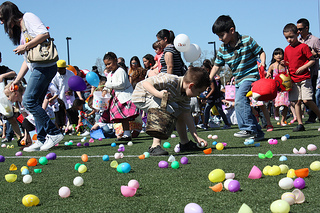 The first egg hunt starts at 10:00 a.m., but go early to register and play! On March 17, we will celebrate Saint Patrick’s Day. St. Patrick is the patron saint of Ireland. Why do American’s celebrate an Irish person? Good questions. I will try to answer them and more. In the Catholic faith, saints are people who talk to God about specific things. If you are taking an airplane trip, the patron saint of air travelers (Joseph of Cupertino) can ask God to help you stay safe. If you are getting married, the patron saint of marriage (John Francis Regis) can ask God to help your marriage. Irish Catholics might pray to St. Patrick, asking him to ask God to help their country. St. Patrick was a real person who lived in Britain and Ireland around the 5th century. He was born in Britain during the time of the Roman Empire, and later in life, he lived in Ireland as a Christian missionary. Historians believe that he died on March 17, 461. 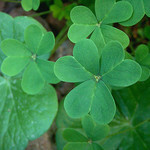 As a missionary, St. Patrick used shamrocks (small plants with 3 leaves like the ones in the picture above) to explain the Christian idea that God exists in three forms. Because of this, Irish Catholics attached shamrocks to their clothes. These days, people wear green clothes on St. Patrick’s Day. Why Do Americans Celebrate an Irish Holiday? As you know, people come to the United States from many different countries for many different reasons. In the mid-1800s, about a million Irish immigrants came to the United States because there was not enough food in Ireland. At that time, the population of the United States was only about 17 million, so the arrival of 1 million people was a lot. It was enough to change the culture of the United States. Those Irish immigrants brought their culture, holidays, and traditions with them, and we still celebrate one of their holidays – St. Patrick’s Day – today. How Do Americans Celebrate St. Patrick’s Day? Raleigh will have a St. Patrick’s Day parade on Saturday, March 14 at 10:00 a.m. After the parade, there will be a festival in City Plaza (at the south end of Fayetteville Street). Check out this website for more information on the parade, the festival, and St. Patrick! There will be food, live music, and dancing, as well as Irish jewelry and other small items for sale. 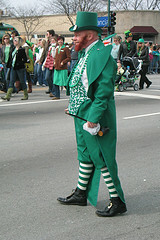 The parade and festival are free, so put on your green clothes and go enjoy an Irish-American holiday downtown! For more information on St. Patrick’s Day, check out this fun video made by History.com! An interesting holiday is coming on Monday, February 2 – Groundhog Day. Groundhog day is not a federal or religious holiday, so there is no vacation from work or school, but it is an interesting day to learn about. A groundhog, also known as a woodchuck, is a small, furry (covered with hair) animal that looks like a very fat squirrel. It can weigh 5-9 pounds (2-4 kg), and it lives under the ground in a hole. 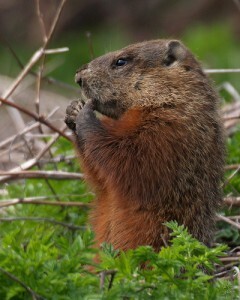 In the fall months, the groundhog eats a lot and gets very fat. Then it hibernates (sleeps) through the winter months, like a bear. The groundhog comes out of its burrow (a hole in the ground where a groundhog lives). If the groundhog sees its shadow, then winter will continue for six more weeks, it gets scared and goes back into its burrow to sleep some more. If the groundhog doesn’t see its shadow, then the groundhog comes out of hibernation, and we know that spring will come early. How do we know whether the groundhog sees its shadow or not? A groundhog cannot talk, so we have to guess a little based on the weather. If the day is very sunny, we say that the groundhog saw its shadow, which means we will have six more weeks of winter. If the weather is cloudy or rainy on Groundhog Day, then the groundhog cannot see its shadow, and spring will come early. Where did Groundhog Day start? American Groundhog Day started in Pennsylvania in the 1800s. We believe it was a German custom, and when many Germans moved to Pennsylvania, they brought this custom with them. Did you learn something new about Groundhog Day? Take this quiz to test your understanding! Dr. Martin Luther King, Jr. was an American pastor (preacher, minister, church leader) in the 1950s and 1960s. He was also a famous speaker and a political activist. An activist is someone who works very hard to change something in society. Dr. King worked very hard for civil rights (the rights of all U.S. citizens), especially equal rights for black and white Americans. When Dr. King was a boy, schools, churches, restaurants, toilets, and even water fountains were segregated. That means that white people and non-white people were separated. This was the law until 1954, when the Supreme Court decided that it wasn’t right or fair to separate the races. A lot of people were very unhappy with the court’s decision to integrate (mix together) black and white people, but Martin Luther King believed that different races could live together and share peace in society. Dr. King believed very strongly that people should protest (say they disagree or don’t like something) peacefully, without violence. He said, “Darkness cannot drive out darkness; only light can do that. Hate cannot drive out hate; only love can do that.” That means we cannot end darkness with more darkness. We need to turn on the lights. And we cannot end hate with more hate. We need to give love. He also said, “I have decided to stick with love. Hate is too great a burden to bear.” That means it’s easier to love than to hate. If I hate someone, it causes too much stress, it hurts me. Dr. King wanted people to change the world, and he believed that love and education were the best ways to do it. Martin Luther King’s most famous speech is the “I Have a Dream” speech. He gave it in Washington, DC on August 28, 1963. You can click here to read and listen to the whole speech. In it, he says, “I have a dream that my four little children will one day live in a nation where they will not be judged by the color of their skin, but by the content of their character.” Dr. King’s dream was that all people would be judged equally, based on who they are on the inside, not what they look like on the outside. On April 4, 1968, Dr. King was assassinated (killed) in Memphis, Tennessee, but his dream of peace and equality continued. In 1983, President Ronald Reagan created an official holiday to celebrate Martin Luther King, Jr.’s birthday. His birthday is on January 15, but we celebrate his life each year on the third Monday of January. Sleep. Sleep tonight, and may your dreams be realized. If the thunder-cloud passes rain, so let it rain, rain down on him. Wake Tech’s ESL classes will be CLOSED on Monday, January 19 for Martin Luther King, Jr. Day. While you are at home, visit this website for more information about Dr. King. Unfortunately, many people make plans in January, but give up quickly. In January, gyms make a lot of money because new people join, but by the end of February, many of those people have stopped going to the gym regularly. In January, people volunteer once or twice, but then many of them don’t volunteer again for the rest of the year. Americans know that New Year’s Resolutions are rarely successful, yet every year, they try again. Why do you think Americans make New Year’s Resolutions every year? Do people in your country do this? What resolutions will you make for 2015? What do Americans do on Thanksgiving? You know the history of Thanksgiving, and you’ve heard about some of the food that people eat at a traditional Thanksgiving dinner. But maybe you’re still curious. What do Americans do all day? What is happening in an American home on Thanksgiving? I asked some American friends to share with you their family traditions. Here’s what they said. In this sentence, “prep” means prepare. Chelsea’s mother taught her how to prepare a turkey before putting it into the oven. “The oven dance” is the act of putting food into the oven, taking other food out, and putting some things in at the same time. You might need to move things inside the oven to make more room for other things. When the food moves around the oven and the kitchen so much, it’s like a dance. In many American families, several people make and bring food to share at Thanksgiving. Webb’s grandmother made a special onion dish when she was alive, but now Webb makes it. When you hear the word “dressing,” you probably think about salad dressing. 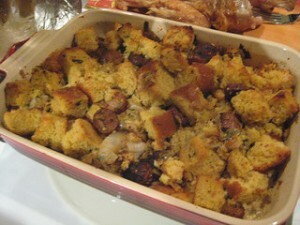 Kate is talking about turkey dressing, which is also called “stuffing.” It is made with bread, broth, onions, spices, and sometimes pieces of turkey or sausage. Football is played mostly in the fall, and there are a lot of big football games on TV on Thanksgiving Day because nobody is working. Everyone is at home relaxing. The most important football games of the year are called bowl games (the biggest one is the Super Bowl). The winner of a bowl game gets a trophy. Angela’s family plays football together on Thanksgiving, and the winner gets a trophy just like the professionals! A “shindig” is a party. Megan’s family is large, so they use two tables, and they change places between dinner and dessert. When she says, “every family unit brings something to contribute,” she means that she brings food, her brother and his wife bring food, her aunt and uncle bring food, her cousin and her husband bring food, and they share all the food. Kate and her husband have two children and four grandchildren. She loves the years when everyone can come to visit. Sometimes her children spend Thanksgiving with their in-laws, though, so they don’t always get to be together on Thanksgiving. 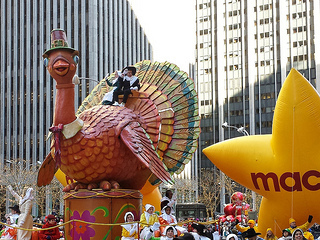 Many cities have a parade on Thanksgiving, but the most famous one is in New York. 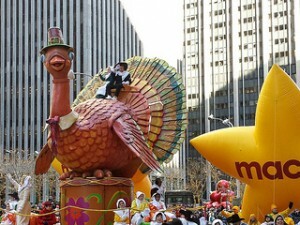 You can watch the Macy’s Thanksgiving Day Parade on TV this year just like many American families!